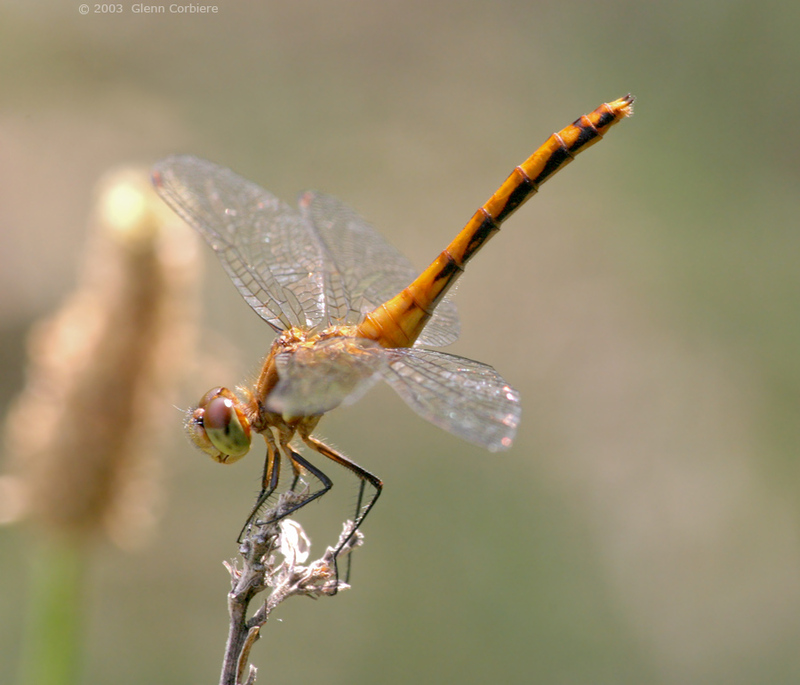 Sympetrum species (likely Cherry-faced or Jane's Meadowhawk), female, Ludlow, Hampden County, Massachusetts. 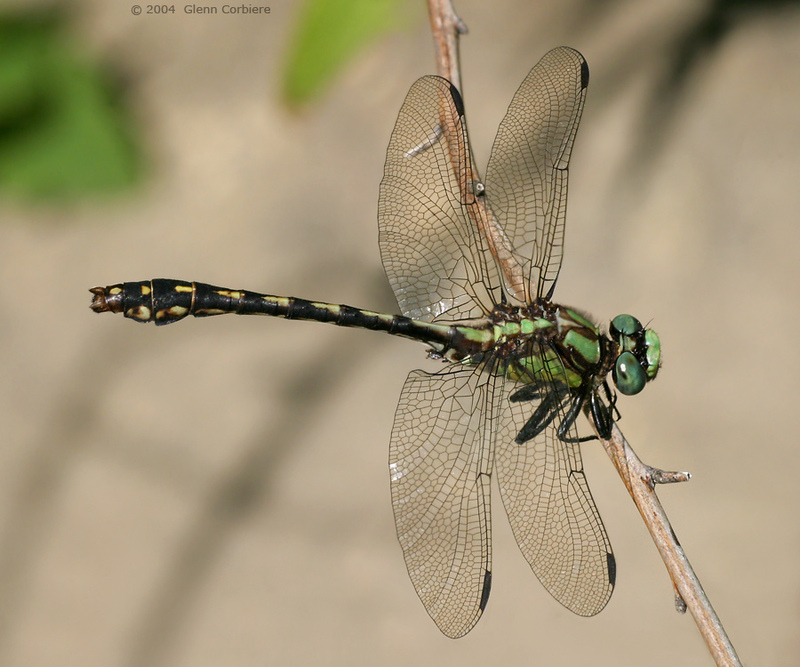 This female is displaying a posture called obelisking. By shifting the position of her body in relation to the sun, she can help to regulate her body temperature. By pointing the tip of her abdomen towards the sun, she minimizes the profile exposed to the suns warming rays, and stays cooler. She can use her wings to shade her thorax in an effort to stay cool. By positioning her body perpendicular to the sun, she maximizes her exposure to the sun, and is better able absorb the suns warming rays. Yes, for the most part my web site portrays Massachusetts species, but I thought I might slip this western species in anyway. I am rather fond of the photo, and I do always include it in my photo exhibits. 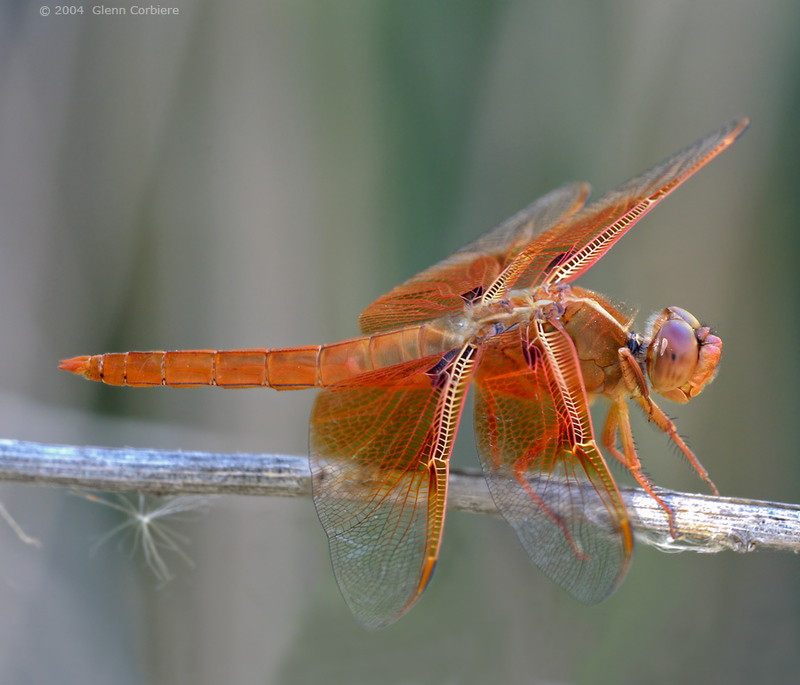 The flame skimmer is common in the west, but it certainly is an eye-catching species, and aptly named. I took this photo at the Desert Botanical Garden in Phoenix. I am lucky enough to have a small babbling brook running through my backyard. As you can see, I don't mow all that often while the dragonflies are flying,. If I did have a manicured lawn out back, Where would this flashy dragonfly perch? This was taken near the banks of the Meanderbrook in Chester, MA. You won't find it on a map. Most of the damselflies hold their wings up and over their back, whereas the dragonflies normally hold their wings out to the side. 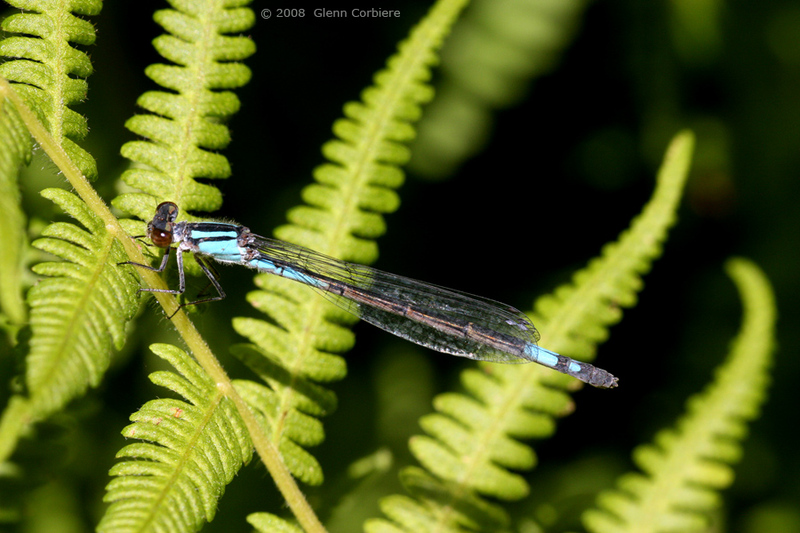 The Lestidae family, the Spread-winged damselflies, are an exception. They have the slim proportions of a damselfly, and they have the widespread eyes and hammerhead look also typical of the damsels. 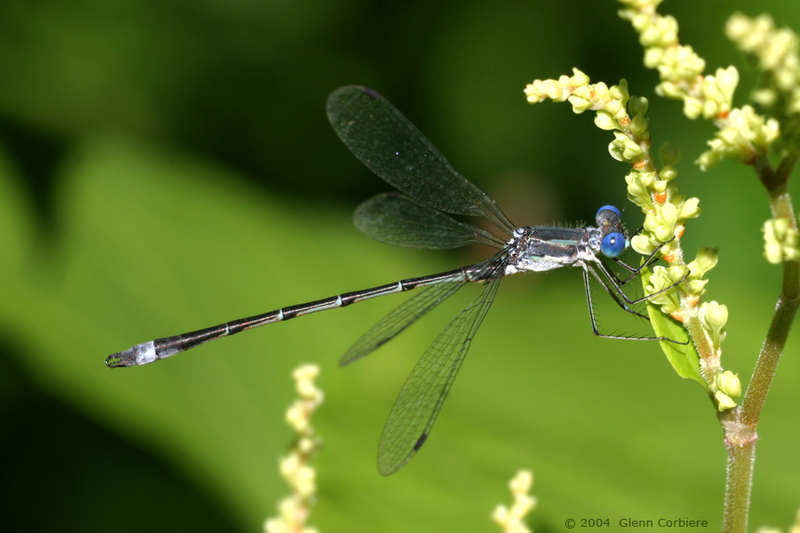 The stalked wings are yet another damselfly trait, but they hold their wings in a more dragonfly like manner. I love the simple elegance of Martha's Pennant, which in this case is set off nicely by the neutral background. 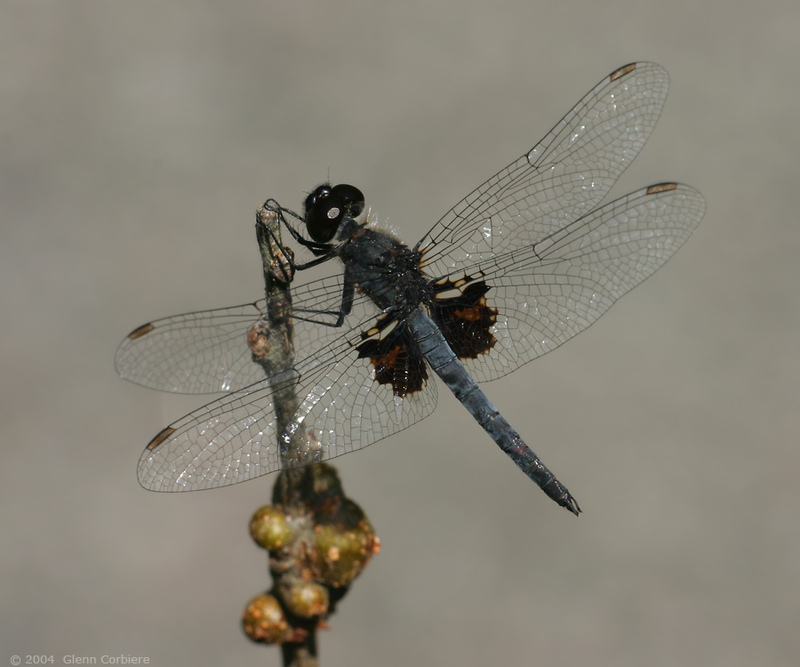 This species has a much more restricted distribution than the Calico Pennant or Banded Pennant, being found in narrow band along the coast from Virgina to Southern New Brunswick. I could be being somewhat anthromorphic here, but it seems to me that the clubtails, more than any other group of dragonflies are apt to stare intently at you. I found this beautiful snaketail on a little island in the West Branch of the Westfield River. He was perched in a quite atypical fashion. Snaketails usually will not tolerate a close approach, but this one did, and he wasn't about to take his eyes off me! Over the years, one of my favorite backgrounds for dragonflies and damselflies has been ferns, and I never pass up a chance to photograph one against this background, no matter how common the species and no matter how many other photographs I might have of that species. Ferns always make a beautiful pattern against a dark background. This was near Knee Deep Pond, along the Appalachian Trail in Lee, Massachusetts. This photo was taken in the late afternoon, in a swampy waterway lined with rich black organic-smelling ooze. (I don't think it could properly be called mud.). The background was the dark swamp and dark woods. This is a natural light photo. 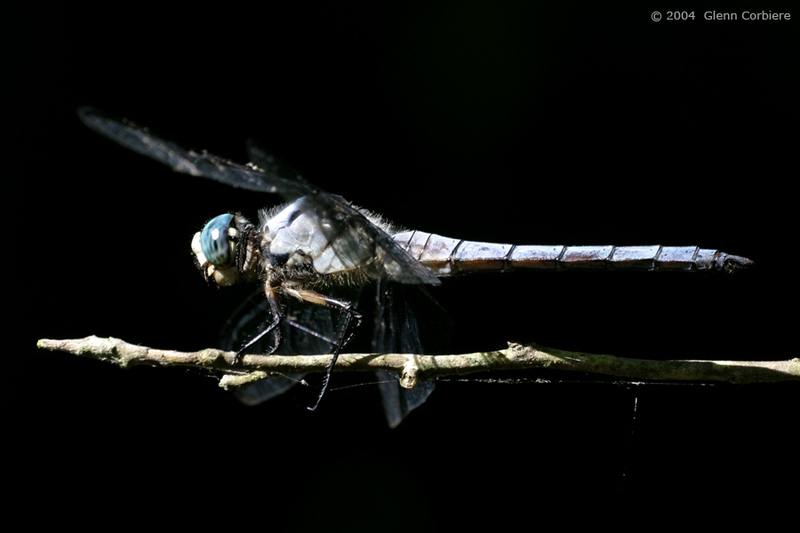 A shaft of sunlight illuminated the branch and the dragonfly, but not the swamp and woods in the background. My legs were nearly as black as this background after venturing out to snap this photo. Images copyright by Glenn Corbiere, and are not to be used without permission.